Step 1 Remove and discard the outer 8 or so leaves from the escarole, leaving the lighter green centers, or hearts. Trim the darkened part of the root end, but keep the root intact. Cut the escarole into quarters from root to tip. Step 2 Pour 4 tablespoons of the olive oil in a large skillet, heated over medium heat. Add the escarole. Cook over medium heat until golden on one side, in batches if necessary. When all the escarole is fried, return it to the skillet; add one-half cup water, cover and cook until tender, about 4 minutes. Remove the escarole from the skillet with tongs, shaking off any liquid. Place on paper towels to drain the excess liquid. Step 3In a bowl, mix the remaining 3 tablespoons of olive oil, garlic, parsley and colatura. Add the escarole and toss. In Recipes-list.com we have selected the most viewed recipes from category - Appetizers Vegetables . Enjoy the best recipes specially selected for you! 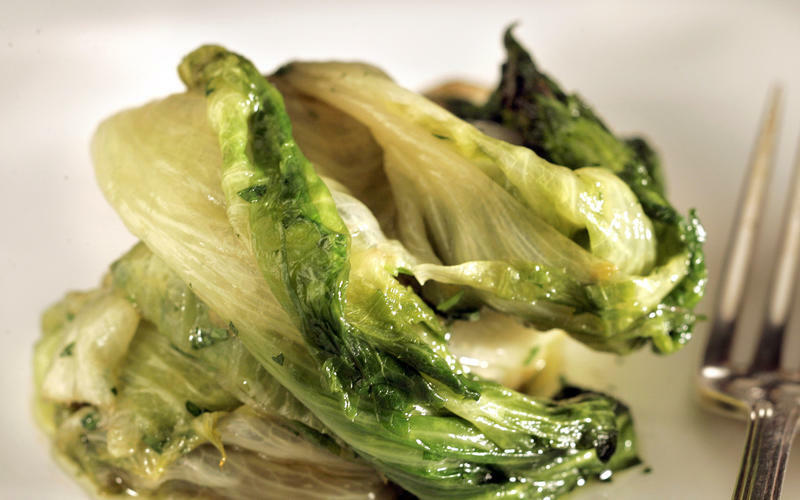 Braised escarole with colatura sauce is the right choice that will satisfy all your claims.